Spray Time or Volume; What Would You Prefer? A marketing ploy often used is that a minimum of 6 seconds of continuous spray is required in order for the spray to be effective. How can anyone make that assertion, when many factors dictate whether or not pepper spray will be effective? Wind direction and velocity, distance of spray vs. distance of bear at the time of spray, volume of spray per second, concentration of pepper in the spray, and area covered by the spray are all important factors as to whether or not a particular brand of bear pepper spray will be effective. Unlike other brands that spray a slower forming narrow fog of bear pepper spray, UDAP Pepper Power® Bear Spray deploys a high volume powerful blast of highly concentrated pepper spray in a dense fog – covering a broader area in a much shorter period of time. If an angry grizzly charged at you, which type of pepper spray would you want? One that emits a thick high volume fog of pepper spray in a powerful blast, or one that advertises it has over 6 seconds of spray time? Now, play the video of an actual bear charge. Then ask yourself the following: How many seconds did the attack take? How many seconds would I need to defend myself against such an attack? Now answer this question: "How much bear pepper spray would you want to put between you and an attacking grizzly; how quickly would you want to put it there?" Get the facts…don't believe the hype! We have never seen any data to backup this marketing ploy. Bear attacks happen as fast as lightning!!! Most situations where you will need to use bear pepper spray will be in a close surprise encounter. When people are injured by bears in most cases it is due to the fact that the person and the bear were unaware of each others close proximity. In a surprise encounter as this, a person usually has less than 2 seconds to react. 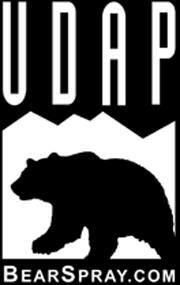 UDAP Pepper Power's® belief is to get as much bear pepper spray as possible between you and the bear in that 2 seconds.